Signed lots of youths that have promise, did terribly in the first few games but ended up 10th. We went unbeaten in January and started climbing up the table and at one point looked like we might make the playoffs but February was poor and we dropped away. We had no stand out players and our youth intake this season only has 1 promising player. 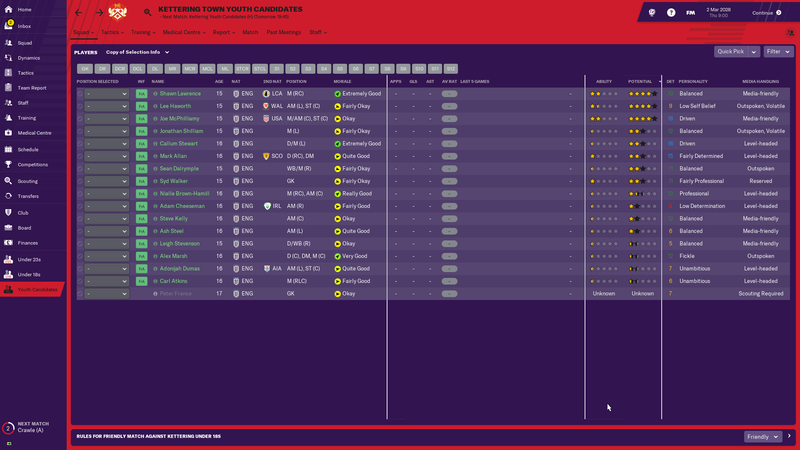 Going to have a huge clearout and try and pick up some of this years premier league youth departures. A fantastic start to the cup run! The most unexpected result went in very defensive and came away with a 3-0 win against a L2 team! I actually dont know the limit number. Usually I offer trail to around 20-25 players at once and kick low star rating players soon as they arive. So you can import more. 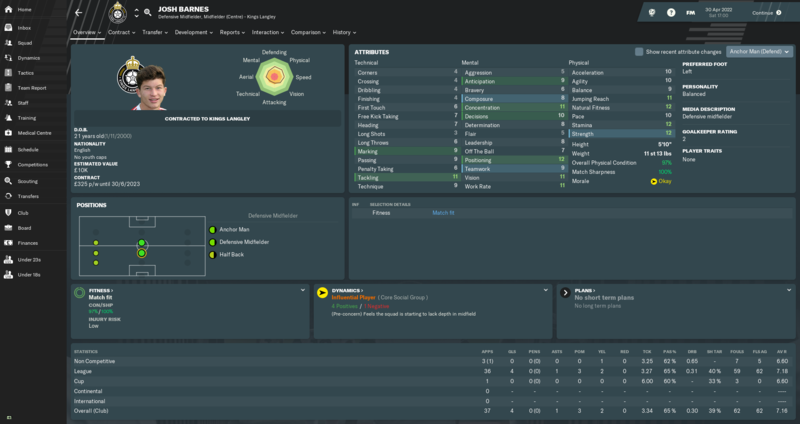 Signed +- 18 free transfer and one player on loan . 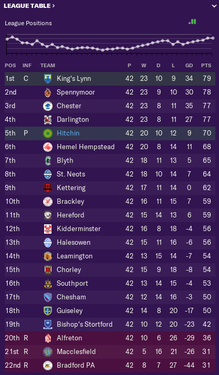 We (Bishop Stortford ) are in the top 6 after 10 games and doing ok with my 3-5-2 . Best player is Sergio Torres as my playmaker. The squad has not gelled up well yet but the results have been great! Scoring freely and winning a lot, lost only 2 games till Jan 1st. 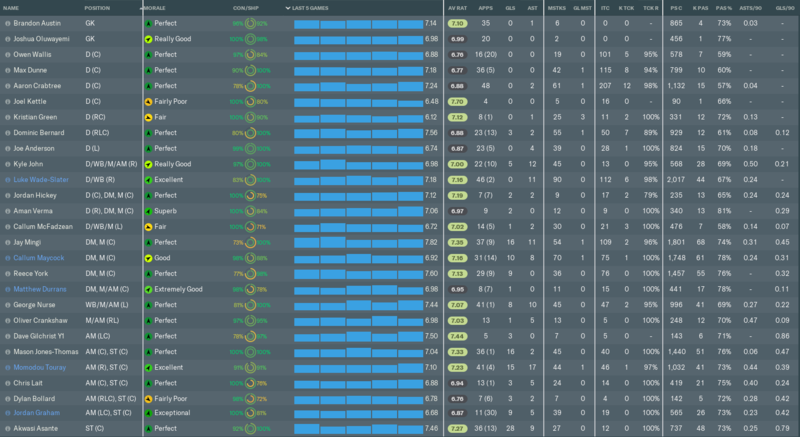 Surprisingly the team is more defensively strong at away matches compared to home matches. I am hoping the team continues this form in the second half of the season, even if we fall off I don't see us dropping out of playoffs at worst. In the FA Cup, we beat Wycombe in the second round coming from 2 down to end it 3-2 though our third goal had hints of offside not given! Lucky break. managed to get my beloved Hendon! That sounds a lot like my first season. 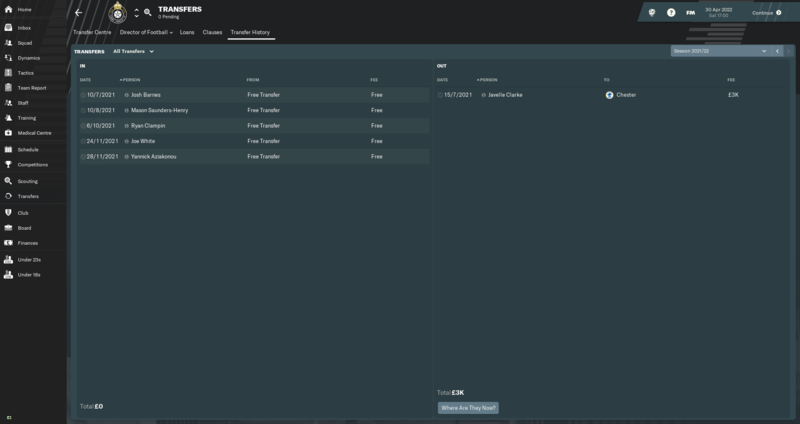 I was so desperate to get a team together I was giving out big wages to average players. Damn we got promoted now I find out VAR wont be in top tier English football cos the save needs to have started on 19.1.5. I am toying with the idea of doing it all over again. @janneff - well done on another great season and the new stadium. 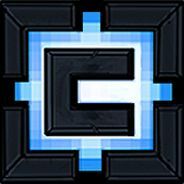 What system have you been playing? i wonder since my systems are failing badly even in the VNL. Yes! 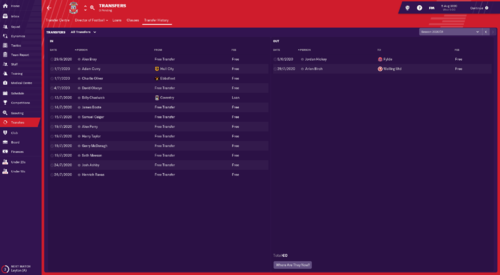 And I had the constant fear of losing out on some of the players I was targetting, I ended up giving them contracts the moment I had a good range instead of waiting for the entire 100% scouting to finish! 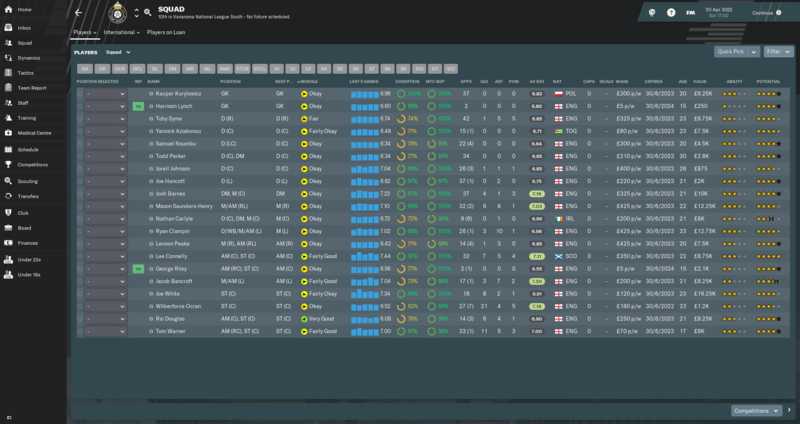 Ended up with few below average players on high salary who was immediately deemed surplus by my staff the moment they joined! Can I get any luckier! We were going to get us a beating for sure and I had the team setup very defensive, tried to be sneaky and went very attacking in the opening minutes and it paid rich dividends as we scored quickly in the opening minutes. Moments later we got a penalty which we converted! I immediately parked the bus and things got easier for us as they got a red card. This was simply unbelievable, I never had such lucky opening minutes of the match. Though they did pull one back, we pegged them back from a corner. And then it was a case of shutting shop which we did well, though the last ten minutes of the match were nervous for me as they scored the second goal. 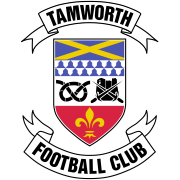 Tamworth is in the FA Cup 4th Round!!! We are going to Everton for 4th Round! Hope its a TV match and we get some good dough! I thought the same, but I'm too far into it now. Should they not be aiming higher? Jokes aside I hope you get out of NL this season! I got out last season! Maybe that's why they are after me! Ah, I missed that update! You are definitely getting your rep up! I am cruising in the in the VNN hopefully I can quickly get out to L2. Any good player suggestions for VNL? No worries! It took a while to get out of it. No suggestion from me, as I'm playing a youth only challenge. 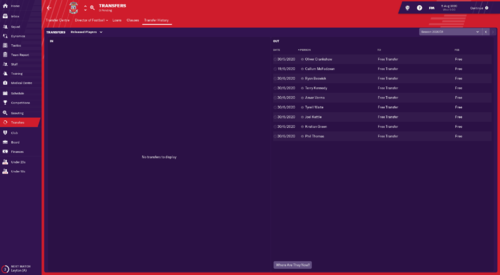 The 2025-2026 saw Whitehawk gain promotion to League 1. In an unexpected over achievement, the team finished firmly in 5th spot after a consistent campaign which saw them finish with the second best attack and a good defence. In the play-offs Whitehawk dispatched Plymouth losing 2-1 away but securing a place in the final with a 2-0 extra time victory at home. 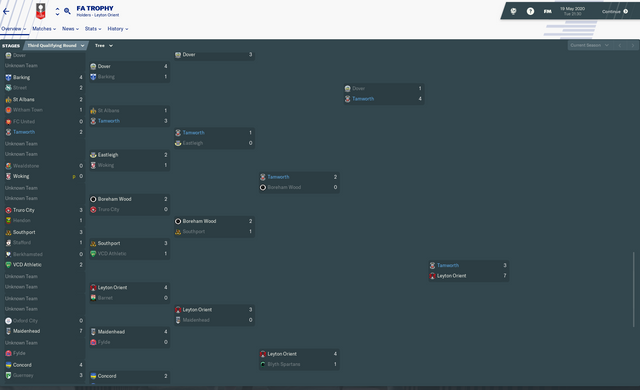 In the final Whitehawk demolished Bristol Rovers 3-0. The media and board's prediction of dead bottom once again destroyed. As usual there was some business in the transfer market but only a couple of major reinforcements. There was some investment in under 18s seeing as the club produces nothing of note. The lack of a youth set-up also means we have to play without an under-23 team. The squad remained more or less the same with just the needed reinforcements to come and slot into the new tactic. The cautious 4-4-2 proved efficient, allowing us to be more lethal going forward and to maintain a solid defence. I will likely continue to use it in the upcoming season. Financially, it's still a downward spiral. The play-off final at Wembley (51000 attendance, 42000 Bristol Rover fans) offered a good boost at the end of the season to prevent a dire situation. With less than 2000 attendance per game, it's hard to rely on gate receipts and with a low sponsorship there's little else coming through. Poor cup runs also meant little income on that side of things. 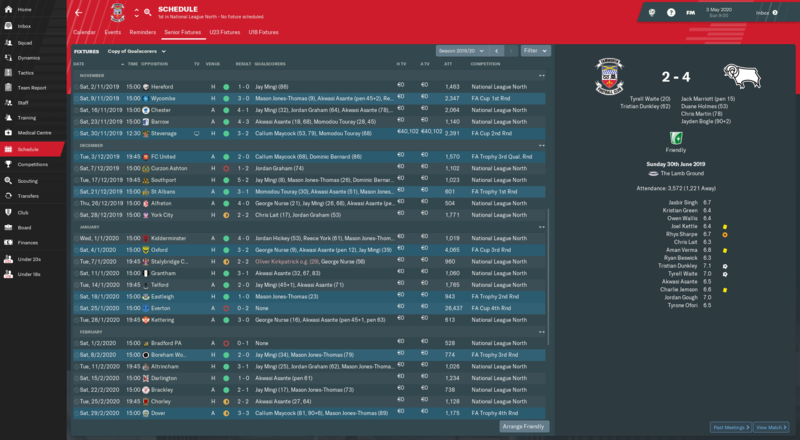 I have already done the preseason for the upcoming League 1 campaign and a host of friendlies, coupled with payments for League 2 and TV rights has allowed me to bring the balance back towards the zero mark, but the attendance will not likely evolve too much over the upcoming season, so I'm expecting another deep negative by the end of the season. 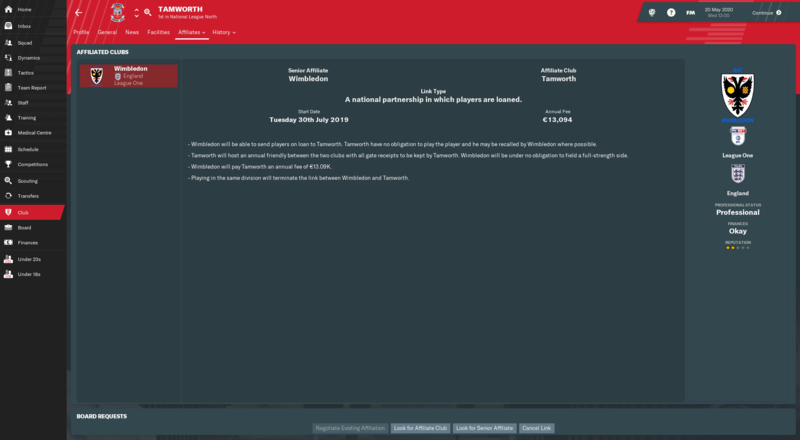 On another unexpected note, Spain offered me the position of National Coach in the summer of 2026, that came out of nowhere. 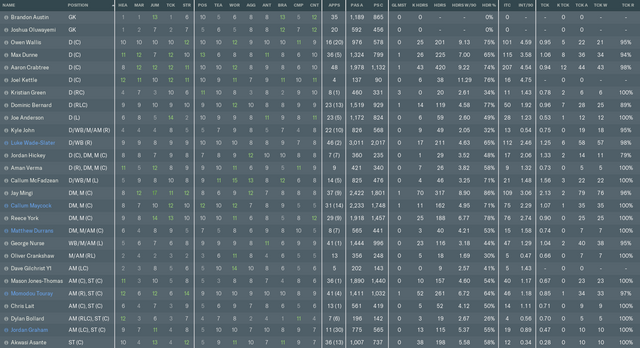 League - First season in the National league so I was unsure of how our team would fare. We had a slow start to the campaign so we had to work our way back into the playoff positions. We were ways off the top teams in terms of ability and the highest we managed to make it was 4th place. York were by far the best team in the league this year and this showed in the final table. We made it past the first round of the playoffs but ultimately lost the semi finals to Maidstone who went on to win the final. We were missing our starting LW who got injured 2 games before the end of season and was out throughout the playoffs and then ended up picking up an injury to our starting LB before the semi final. We definitely could have won but a poor first half meant we needed to come behind, each time we got one back they scored another. The match ended in a 3-2 win for Maidstone. 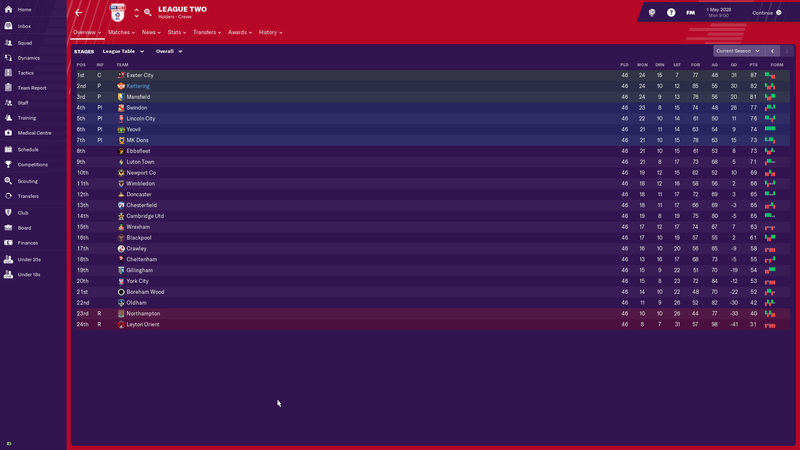 Overall this was a good season even though playoff losses are very disappointing being that close to promotion. It looks like next season better players are willing to join the club. 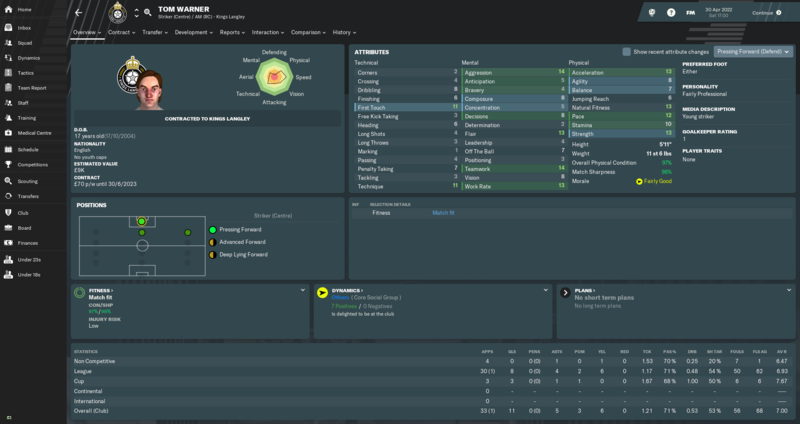 I already have a new striker joining, an 18 year old from Chelsea. 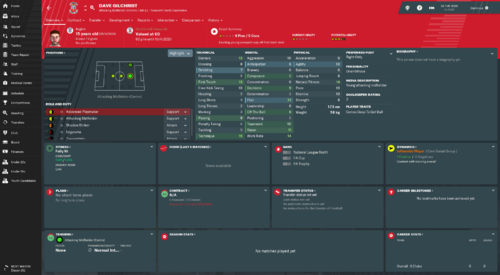 He is already better than Banton and looks to fit in perfectly for our tactics. Next year we will push on! Cups - Same old story with the cups. FA cup started poorly which saw us needing a replay against VNS side Chesham(first game was at home as well). Made it to the 2nd round once again and at least lost to a team in a league above us. Really hoping to get a decent run / draw so we can get some much needed monies. FA Trophy saw us reach the third round before losing to Dag & Red who finished 18th in our league so that was a bit upsetting. Finances - Still lacking the money, stuck with no upgrades until we get some money in the bank. League Table: We only managed to finish on 12th position in our first season, but overall I think it was a decent season. 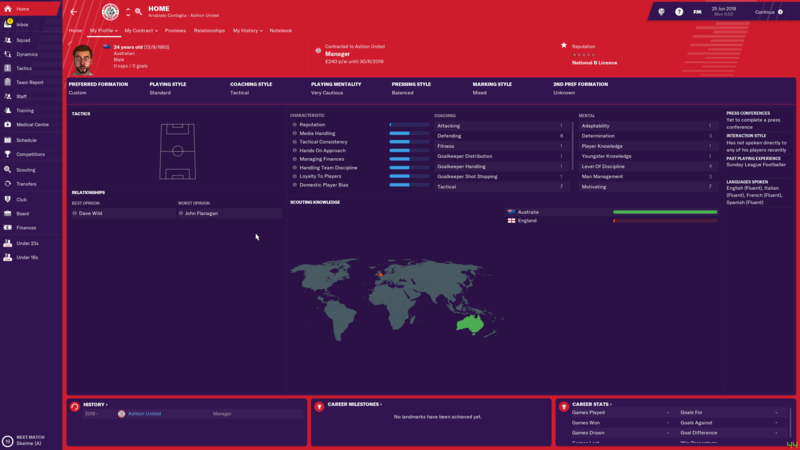 Transfers1; Transfers2: We signed a lot of players and almost all the year we had trialists in our yard trying to improve the squad and preparing the future campaign. Squad1; Squad2: Overall we had a pretty fast squad for this division but we lacked the quality. Almost all the players will leave us this summer, I’m trying to build something different here and I’m aiming for a playoff spot next season. 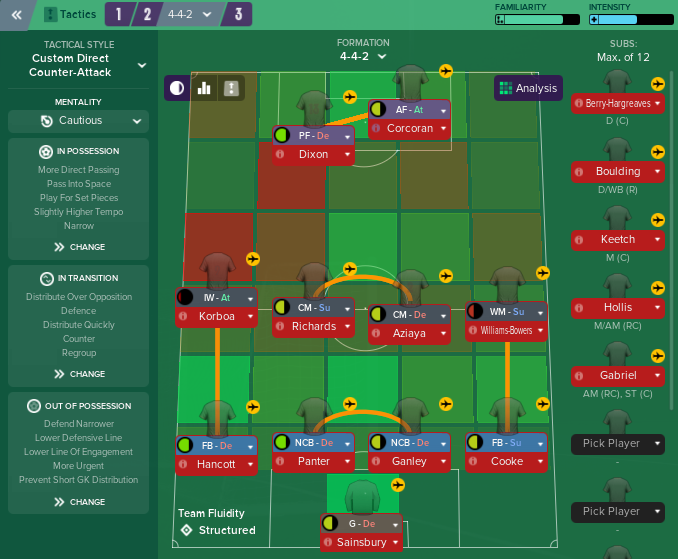 Tactics: When I started the save I had a certain tactic and style in my mind but because my best players could only play in the AM positions I was forced to play a 4-2-3-1…till January. In January I switched to how I wanted to play from the beginning: a low block 4-4-2 inspired by Ranieri with “my Mahrez” on the left wing. That gave us an unbeaten January with 4 wins in a row and a certain DNA for the future. Finances: We are doing great actually and I’m really surprised. Best Defender: Corey Panter – I think his positioning let him down sometimes but overall it was our best defender. Best Central Mid: Jack Richards – Not the best midfielder in the world but he could pass the ball around. Best Winger: Ricky Korboa – “My Mahrez”, 10 goals, 7 assists, 6.92 average rating. Unfortunately he demand too much money for a new contract and will leave us. Best Striker: Mike Dixon – Physically a beast, 19 goals, 6 assists, 6.96 average rating. With his physical skills, bravery and work rate he fit best into my PF (D) role. I hope I can keep him. 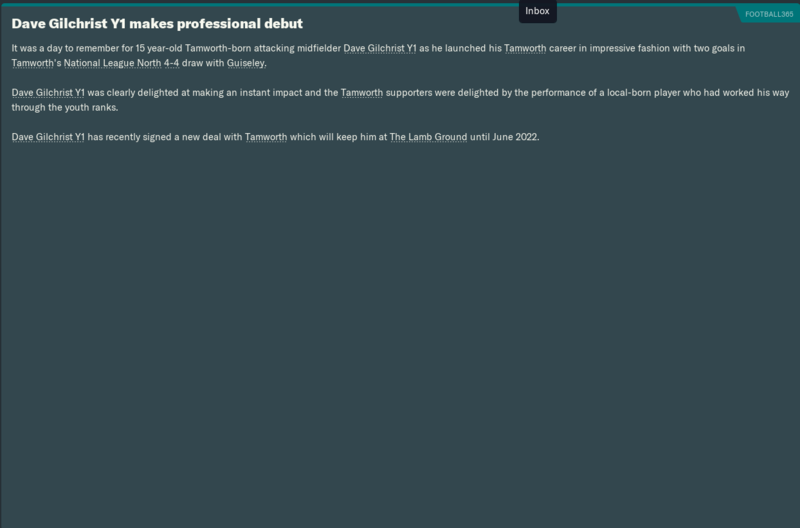 Dave Gilchrist not a bad prospect in the first season too! 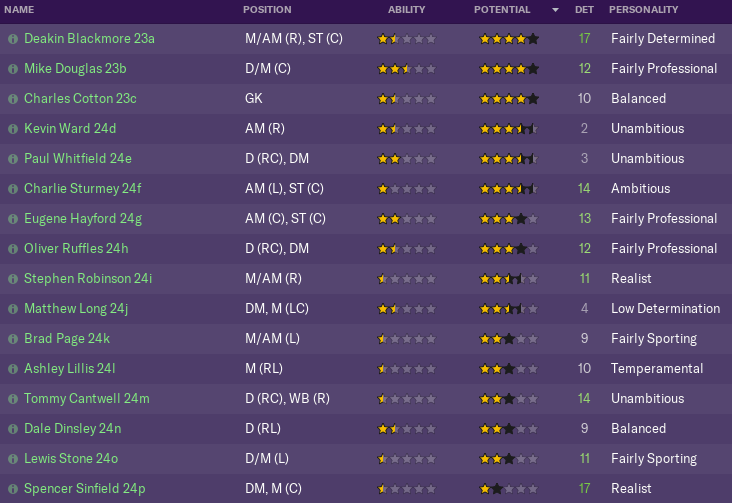 The rest of the youth intake does not inspire any confidence that they will even get to pro contracts at club before being bid goodbye. 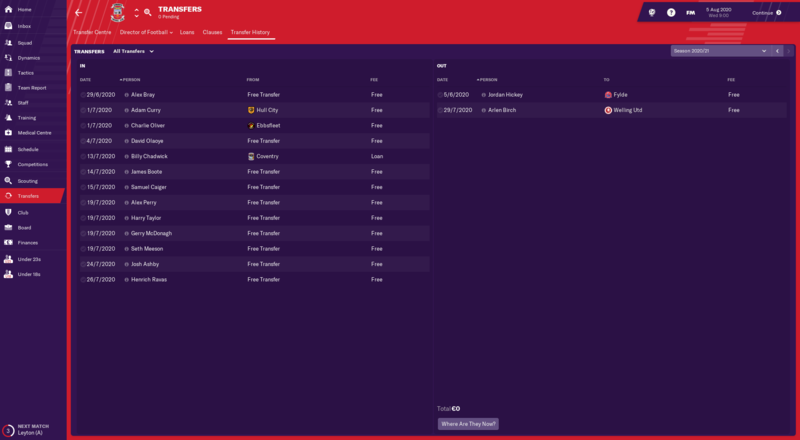 Also got offered a new contract, and pushed the board to increase the wage budget, was at 7.5k, they offered 8.5k and in the end got 10.5k a week! Only 2k now overbudget! FC United is not on the list of teams if I am not mistaken they were already in NNL at the start of the game so does not qualify for the challenge. Also the jobs you mentioned none of the teams Southport or Chorley qualify for the challenge. Aight, I'm in! Ashton Utd! No I mean what are the chances of the clubs being promoted (to conference north and south) at the end of the first already having managers? 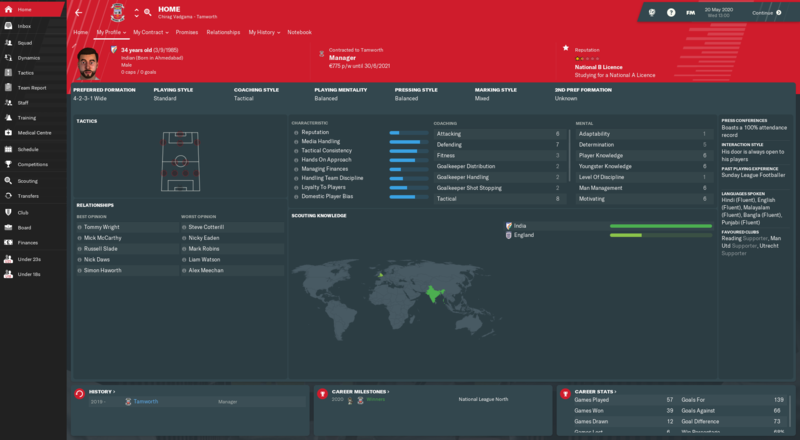 I though this thread would be the best place to ask, I've already played my first season as FC United and got sacked, there's a few jobs available but I want to wait to see what clubs come up, but I'm worried all the clubs that come up will already have managers. Ie does a club always come up with vacant manager position? Your save has been going great! I am jealous of how far ahead you are, I am barely into October of the first season! Thanks Prank Emperor. It's been great save so far. I had lots of time to invest in this save when the beta was released. Now the progress is slightly slower but I'm still confident that I can beat this great challenge. 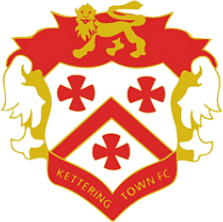 "Kettering will look back on the season as a job well done as they impressed sufficiently to break clear of mid-table obscurity and announced themselves as a club on their rise, finishing above their expectations." League Table - We finished 8th which was our best finish so far. We also managed to improve our total points. We looked very good and to be honest we were unlucky not to finish higher. We had the second best defensive record and we created second highest amout of chances. However we only scored 10th highest amount of goals. I guess it's safe to say that we ran pretty bad. I don't blame our strikers. Brighton almost won the Premier League. They were leading most of the season but in the end they managed to bottle it. I tried to do well in cups but we were terrible. Transfers - We lost few of our key players because of minimum fee release clauses. William Kasongo was expected but losing Laurence Capel was particularly disappointing. We have only few quality english players and Lauren was definitely one of them. Rodrigo Musson was probably our most important signing. He's the kind of player that we lacked of and he was probably one of the biggest reason why our defensive record was so good. He's personality is highly questionable but it is what it is. Instead of showing key players this time, I'd like to show our key prospects. Though it could be argued that they are our key players already. I believe that these three players will play big part if we are ever going to beat this challenge. Robert Guerroro is truly amazing central defender. He doesn't have any real weaknessess. Technically he could be slightly better but he has learnt to play simple passing game so he's not liability with the ball. I think he could be world class central defender one day. Labinot Redjebi is very versatile playmaker or creative forward. He has great dribbling, first touch, techique and vision. He's currently learning to run with ball more often so he can create more chaos. Michael Roels finally managed to develop his weaker foot. His personality also improved from balanced to fairly determined and his determination also improved. If he can develop his composure, he should be one of the best strikers some day. I want continental qualification. I think our squad is already strong enough to win Europa League. We are also going to make the switch from 4-1-4-1 to 4-2-3-1. I believe this should help us to take the next step. 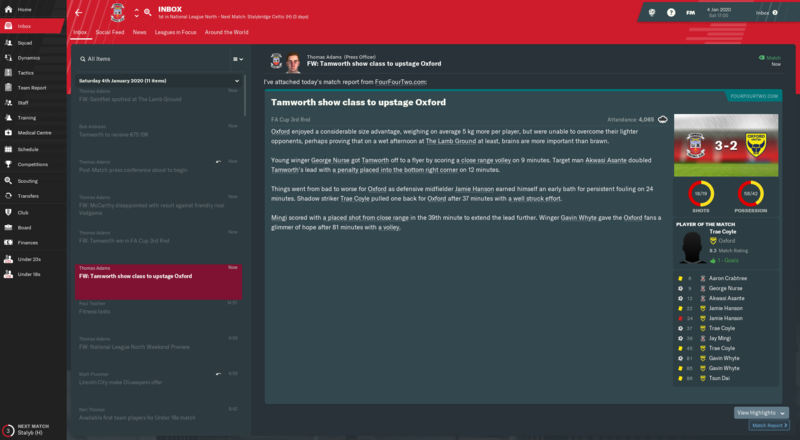 Well 13 games into my first season in League One and I was fired for requesting improved training facilities (they were still the basic ones I had all the way back in National South). I was lying in the relegation zone, my National League grade players struggling to do anything. 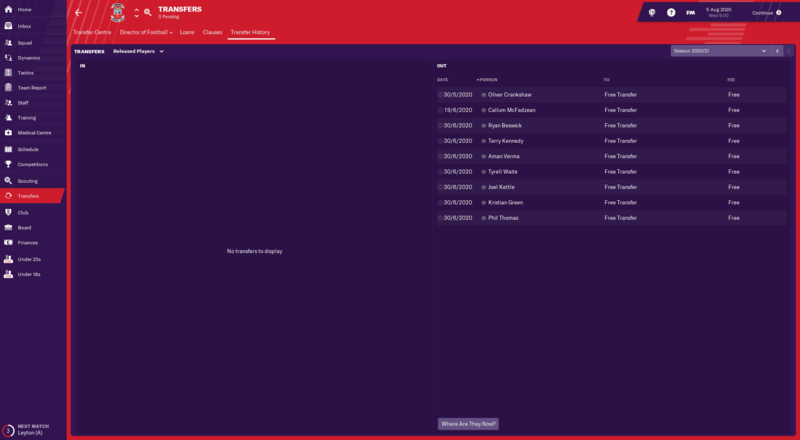 My main problem was not being able to attract anyone above National League, decent League 2 level as the club's reputation was still at that level, then finances meant I couldn't offer the same wages as most League 1/2 sides. 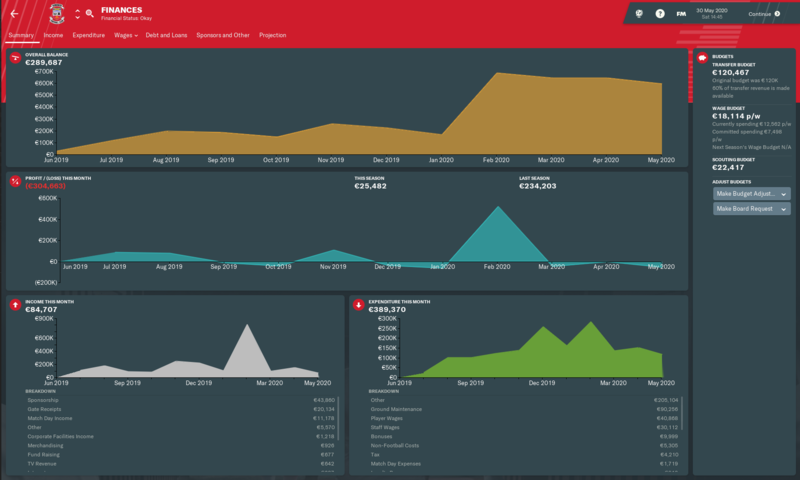 I had just played Man Utd in the 4th round of the league cup and lost 5-0, but the money earned from this meant we went 300k positive, the first positive balance since the first couple of weeks of the story. I requested the improved training facilities due to this money and when they refused, I insisted, which meant I got sacked. I will probably restart at some point with a different club. 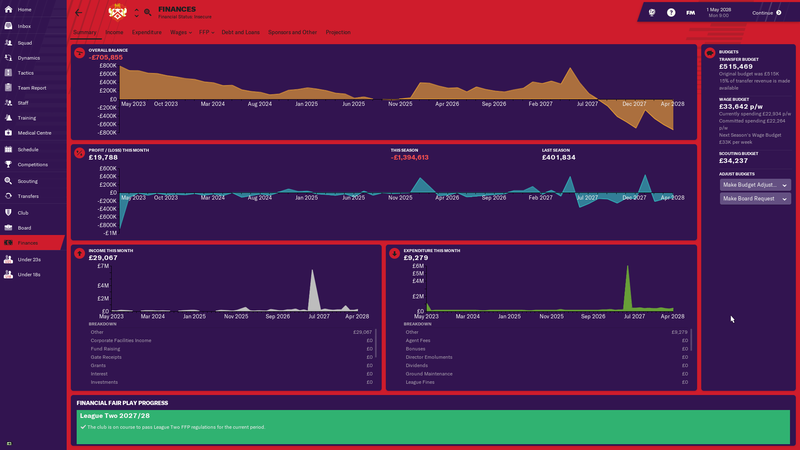 It was a pretty quiet season overall that went more or less as I had expected (or at least had hoped). We did pick up 2 wins in our first four matches, which gave us early hope that we could compete, but overall we just struggled. Our early rise to 14th on the table would only be eclipsed once (for a single week, when we hit 13th on match day 28 w/ a 4-2 win vs Macclesfield). Brannigan was our only real offensive threat, despite being rated FOURTH of our four strikers by the coaching staff (2* CA, with 2x2.5* CA and a 3.5* CA) striker also on the roster. In particular, Niall Huggins, who plays the same role as Brannigan, and who, in the past, served more than adequately in that role, just could not do anything in the VNL. his 5 goals/4 assists means he'll not be with the team again next season. (I'm still debating Brannigan, who I almost have to sign if I want to see any goals next season!!) 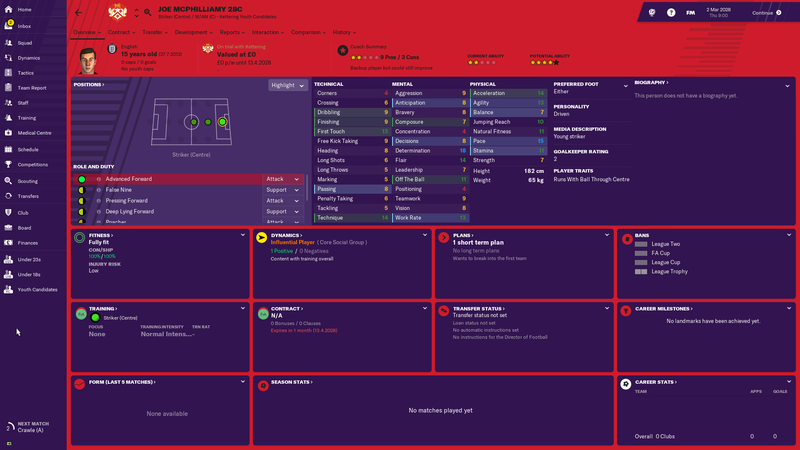 Late in the season, I signed VNL CA Ryan "the Tree" Brunt to provide a bit of aerial ability up front --- he only managed 4 goals/2 assists but I'll keep him on the team for the coming season and tweak the tactics to involve him more. Jake Kelly will remain my #3 striker, playing on the left in both the 4-1DM-3-2 and 4-3-3 formations. He managed to hit double-digit goals (if only barely) to stay relevant. (Both he and Brannigan being resigned will depend on who I might be able to pick up in the off-season). Defensively, we were, for the most part, a mess. We ended 21st in goals allowed -- though that number is a bit inflated with several 4+ goal conceded matches skewing the average a bit. Defense will be my number one priority in the coming season. Jordan Hickey played most in the DM/A role, but dropped back in DC as needed for rotation/rest purposes. He also contributed 5 goals vi DFKs, and had 7 assists as well, so he'll easily receive a new contract, although I still need a solid/standout DM. Matty Argent-Barnes was also solid, especially defending against aerial threats, and is certain to be back next season. Most of the rest of defense needs upgrading however. My midfield is still pretty solid, anchored by Mark Helm, who is now one of our best overall players on the team. 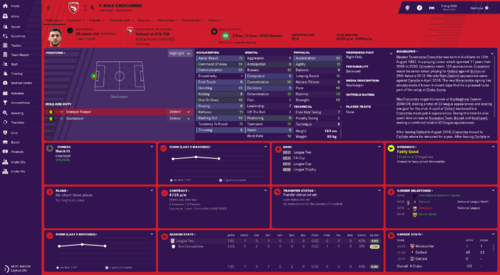 When I lost two MCs late in the season, I went out and loaned Jack Edge (a player that I had tried to pick up in Season 2, but he got away from me!) 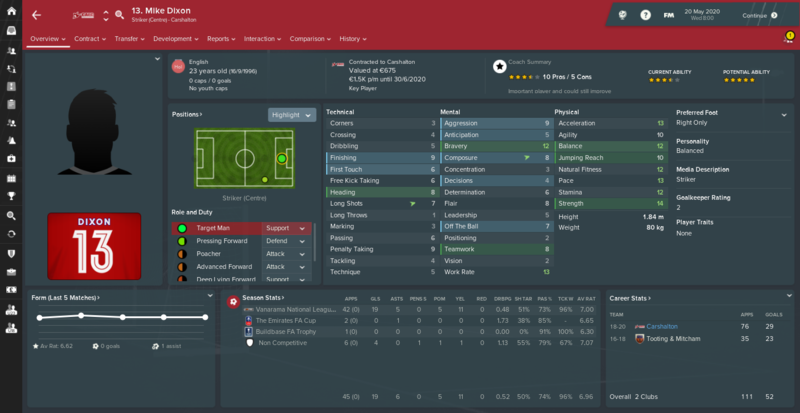 I managed to bring him back on loan, and will try to bring him back next season as well. The duo would make a potent force for me in midfield. Overall, the season had to be considered a success, but I'm sure we'll have to work hard next season to avoid the relegation scrap. Never in the cards this season. Probably not next season either! The cup competitions were not very good this year. 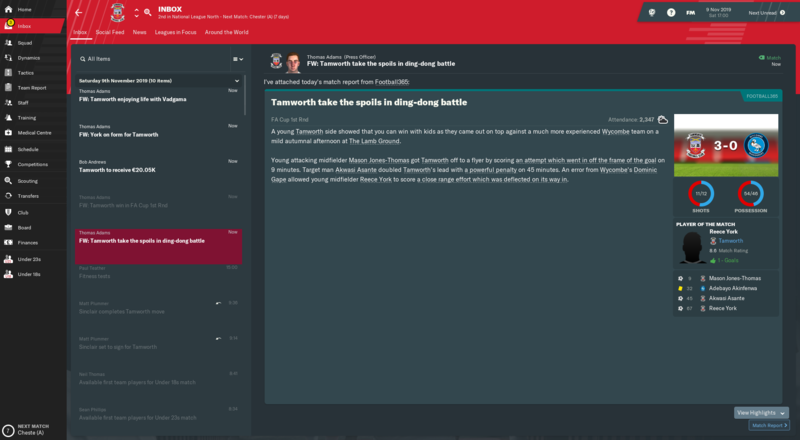 Expectations were for us to reach the 2nd round of the FA Trophy competition, and for the first time we fell short, meeting Barrow in the First round. Niall Huggins only goal was not enough and we fell out of the competition 2-1. The FA Cup competition saw us play a couple more matches, starting in the FAC4QR where we had to force a replay vs VNLN Scarborough in an entertaining 5-5 match which saw us score our fastest ever goal (58 seconds) to open the match, only to concede in the final minute and force the replay. The home replay was almost as entertaining, but we were much better defensively and we ran out 6-2 winners. This win set up a match that was as boring as the first two were exciting, with us at home facing L2 Grimsby. We played tight and went into the half 0-0, but conceded our only goal just before the hour mark in what would be enough for Grimsby to advance. Best XI Inductees Two more players added this year, DC Mohammed Diaby (52 app, 6.88 AvR) and Mason Goodridge (40 app, 7 goals/2 assists) were deemed good enough to make the list this year. Fans Player of the Season Darren Brannigan finally has the adoration of the fans, as he led the team in goals, assists, AvR, and PoM. This garnered him 44% of the FPoY vote. Multi-purpose defender Jordan Hickey won 25%, while GK Pearson finished third with 19%. Signing of the season went to DR Rob Barlow who my scouts found after he was released from Man City. 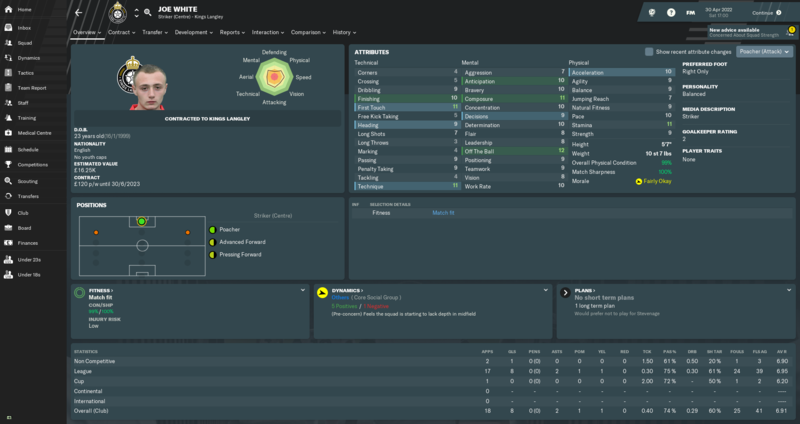 He did enough in a 3-man rotation to get a new contract for the coming season. Goal of the Season: Jordan Hickey, one of two DFKs scored by Hickey against Leyton Orient, enroute to a 3-2 league win. 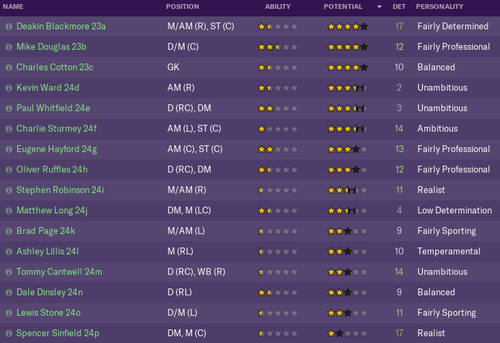 Season 2 Academy Class: A bit lackluster overall, with George Thorne being touted as the best of the lot. 2-3* potential...if he actually is able to meet the potential he might be useful later on. 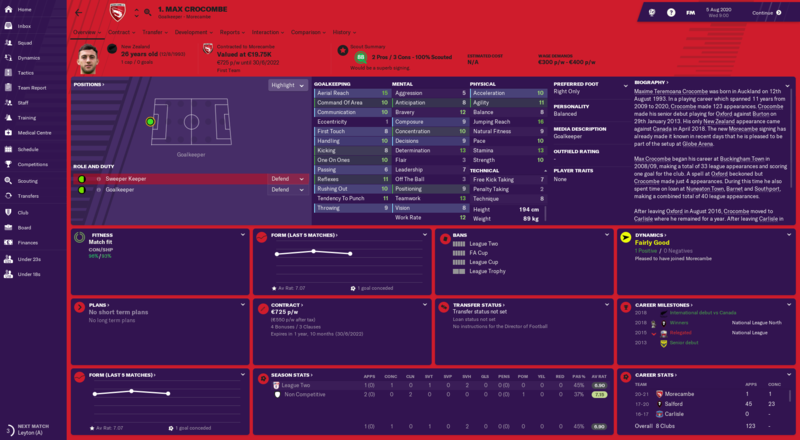 Season 3: Top grad Graeme Cowburn has a couple decent physical and mental stats, but abysmal technical attributes means he'll need a lot of help to ever make the senior team. Our stadium expansion completed in early December, which should be enough expansion for a couple of years at least (or until we reach another level requiring expansion). At a cost of £350K, the expansion added 500 seats and an additional space for 500 standing, for a total expansion of 1000 fans. We're a long way's from filling this out! What we need to concentrate on next season is defense. Our 87 goals conceded was 4th worst, and it was only fortune that we didn't end lower on the table (our 66 goals scored was enough for 16th---the same spot we ended in the league). If we can get rid of some of those leaks in our defense, then I can concentrate on improving our scoring chances. 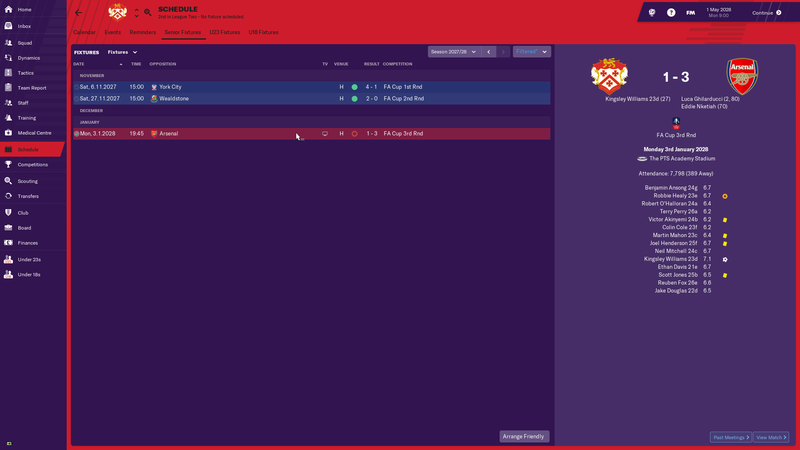 So I've decided to start anew this time I chose South Shields from the six available clubs, let's hope for a better result. Have you considered using your preseason to make some coin? Home friendlies against the top 6 PL U23 teams as well as Leicester, Wolves, and Watford main squads had me at ~600k AUD balance before the start of the season. Not an optimal preseason but I think it's been worth it so far. And we finish the season as champions, update coming up soon! I was having 16/17 games against PL and Championship sides to try and balance the books, the only reason the club weren't 10M in the red was because of that. As I've mentioned, the wages were always well within budget, and I made sure of no pointless expenses (such as yearly wage rises or unused sub fees...). 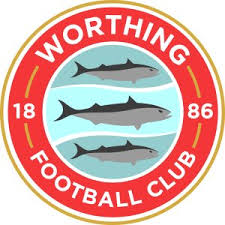 The Whitehawk board were just very hard to deal with and they didn't once inject money into the club, apart from the one stadium expansion. 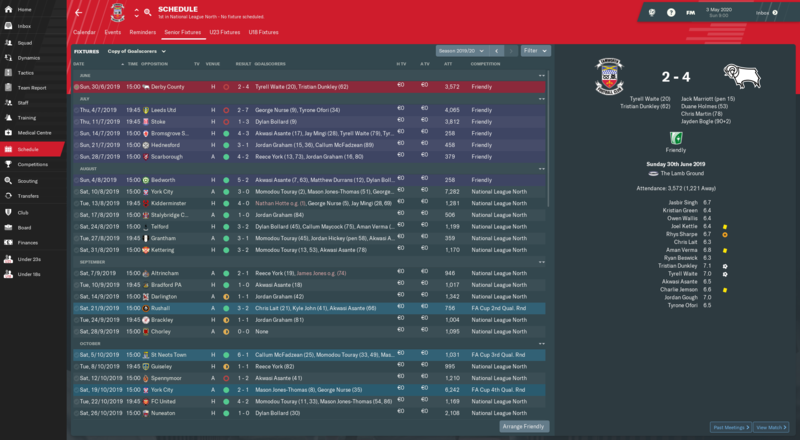 I'm already seeing the difference with South Shields, a strong preseason and I'm over half a million in the positive. There's not much to do with 2000 attendance in League 1. That Man Utd game alone netting me over 800k. My mistake though was forgetting the director had retired during preseason, this meant my job security went from untouchable to secure. So when I insisted, my history with the club counted for nothing. 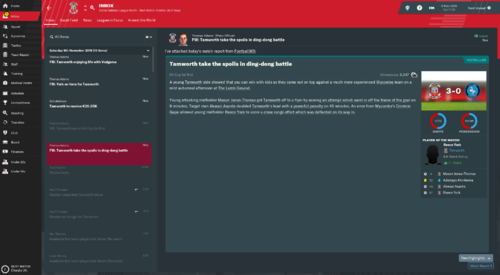 My reign at Tamworth F.C. started with a bang and long may it continue! The media predicted us to finish 20th, however, we defied all odds as we finished as Champions with media declaring as the Overachievers of the league! 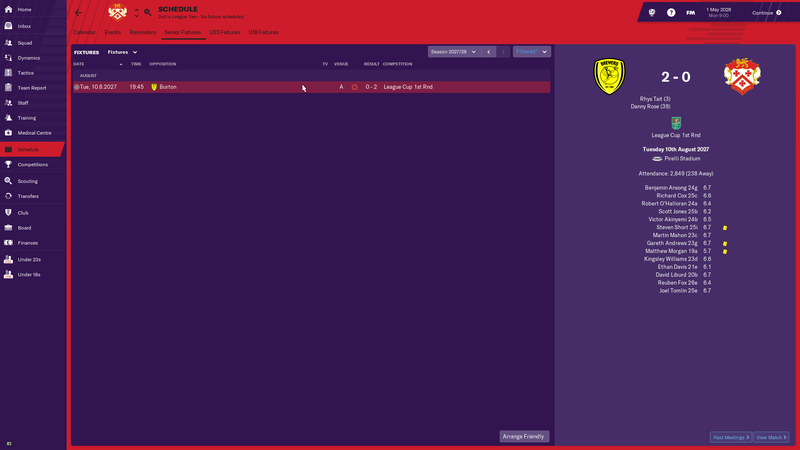 We started the league with fantastic form, scoring freely before we hit a speed bump mid-September to mid-October in the league as we failed to win for 5 matches while at the same we tore apart oppositions in the 3 matches of FA Cup qualifying rounds during the same period. It was the most contradictory period in terms of performance during the entire season and I just could not fathom the reasons behind such a difference in performance. Post this period the players hit a purple patch and we again started scoring for fun and tearing apart oppositions as we lost only 2 and drew 3 matches till February end. February end as well as the entire month of March, my defence was missing in action as we kept scoring for fun but we started conceding for fun as well and the drubbing we received in the FA Trophy semi-final over two legs against eventual winners Leyton Orient probably got some sense in our defence as we again went back to being the misers we were. We ended the season on a high as we finished title winners by quite a margin though it was tight through the season before other teams fell away. 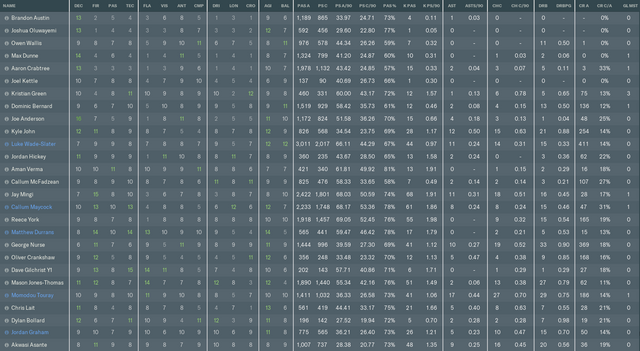 We finished the league with a massive 101 goals as well as highest average possession. 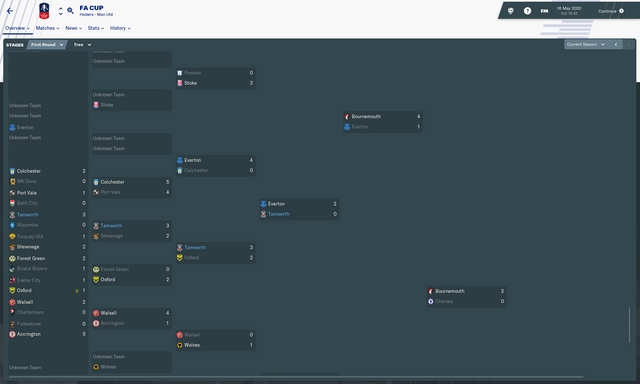 This was a memorable cup run as we ran riot in the qualifying rounds, easily reaching the First round as expected. In the first round, we face League Two team Wycombe Wanderers which I did not fancy my team winning by any stretch and had set the team to park the bus. 9 minutes into the match a brilliant run and cross from the deep by club vice-captain George Nurse into the penalty box was cleared by opposition defender. However, Mason Jones-Thomas picked it up on the volley outside the D and turned running past a defender to put the ball into the top corner of the goal from outside the box. Asante scored a penalty just before halftime and Reece York finished the game off in the final third of the match as we finished the match 3-0 winners while limiting the opposition to only 2 shots on target. 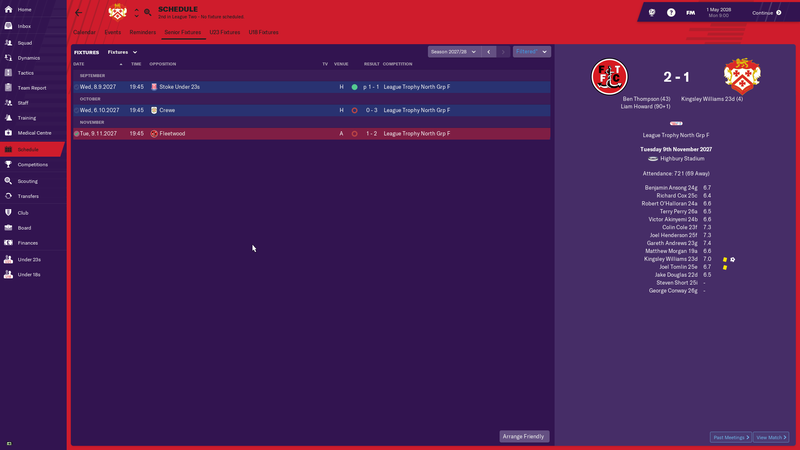 Next round we had a Televised match at home against League Two team Stevenage yet again we went in with a defensive game plan, however unlike the previous match we were one down after 13 minutes and were 2 down after 51 minutes. I brought in our final substitute Jordan Graham and with his first touch of the ball after coming on, he set up fellow substitute Callum Maycock as we pulled on back the very next minute. The substitution seemed to help as the team started playing better as we were up 3-2 by the 79th minute finishing the match as winners with Maycock scoring two goals. The next round saw us go up against League one Team Oxford United yet again at home the team literally played out of its skin as we won 3-2 which was made easy by the red card for opposition player in the 24th minute. In the 4th round, we faced Premier League team Everton away and came back with a respectable 0-2 loss which did help us massively with the finances thanks to the gate receipts. 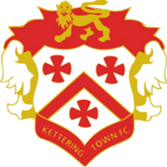 The FA Trophy run was not as dramatic as the FA Cup mainly due to the opposition of being of similar or slightly better strength. We got through to the 4th round easily before being drawn away at National League team Dover we were outplayed all match as we trailed 3-0 before going gung-ho in the last ten minutes which saw us score immediately via substitute Callum Maycock. However, with time running out I had given up any hope before Mason Jones-Thomas yet again pulled out a screamer from outside the D into the top corner in the 89th minute, the goal earning him the Goal of the Season award as well. The last play of the match at 6 minutes into injury time, had us take a corner and out of nowhere, Maycock comes up with a brilliant strike into the top corner from outside the box helping us earn a deserved replay at home. We finished the replay at home as winners, however, till the last 15 minutes of the match, it was tied 1-1. Yet again it was brilliant substitutions which changed the course of the game as Reece York scored 2 and Jordan Graham scored 1 to help us win 4-1. 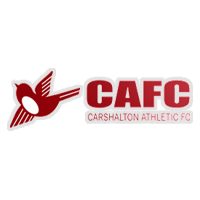 In the semi-finals, we faced eventual champions and National League team Leyton Orient over two legs losing the away 0-3 and home 3-4. Club captain Aaron Crabtree, a 19-year-old Central defender was ever present in the squad as he led from the front with the most appearances. He was everywhere and a constant thorn in opposition strikers as he finished the season with the highest number of headers, interceptions, key tackles and was equally good with the ball at his feet as he was amongst the top players in passes attempted and completed. Momodou Touray started the season as one of the first choice strikers before being he lost it to Akwasi Asante. 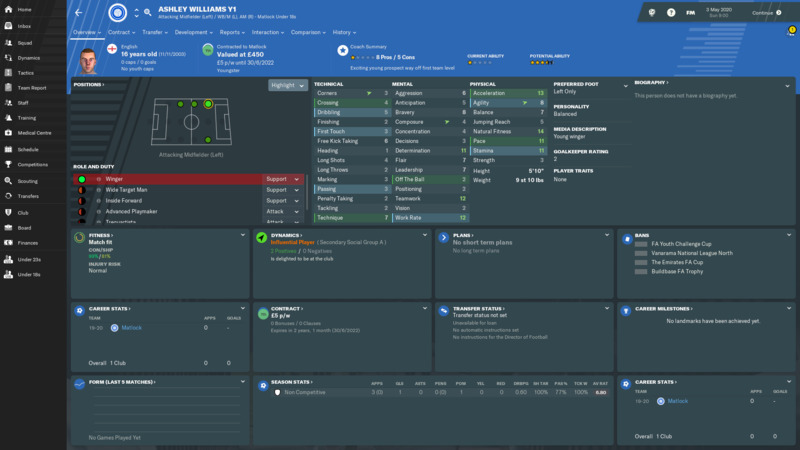 Touray easily transitioned to the Wide Target Man on the right wing pushing out first choice winger Kyle John and finishing the season with 17 assists as well as 15 goals Asante finished the season with 28 goals, as well as finishing the league 3rd highest goal scorer with 23 goals in the league. 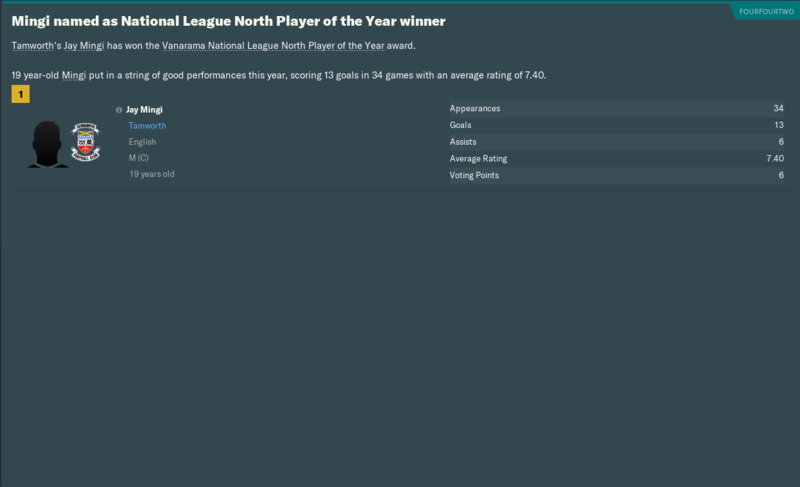 The best player of the season for me was Jay Mingi and he was also rightly awarded the National League North Player of the Year. Mingi bossed the midfield as he was literally everywhere be that in stringing together plays, mopping up opposition plays or getting to the final third to score goals. He also won the Fans' Player of the Season, Signing of the Season and Young Player of the Season. 15-year-old Dave Gilchrist made his debut right after coming through the intake and has a memorable debut scoring two goals. 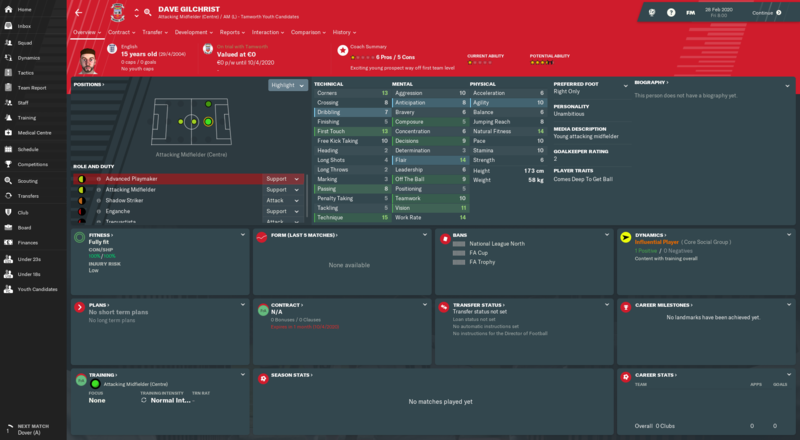 Youth Intake overall was a disappointing affair but Gilchrist looks like a promising player that can serve me well for some time. However, his Unambitious personality is of a concern but hopefully the mentoring works and he develops well. 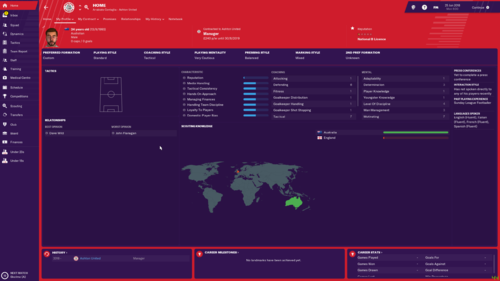 In April, The Chairman announced he was retiring and the club was taken over by a local businessman. The club also announced upgrades to the youth facilities as well as Youth Recruitment improvement. Over the course of the season, I was able to persuade the board to upgrade the Data Analysis Facilities 5 times. We did quite well in terms of injuries with only 18 injuries in the entire season with no very long injury layoffs. 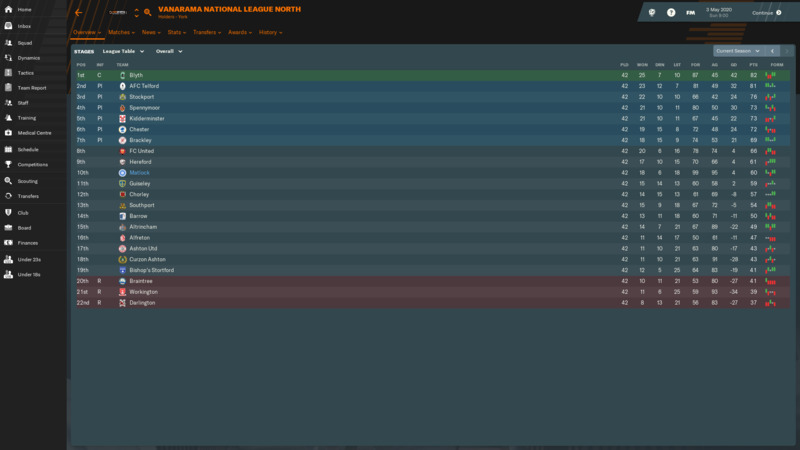 Also, yours truly ended up winning the National League North Manager of the Year. 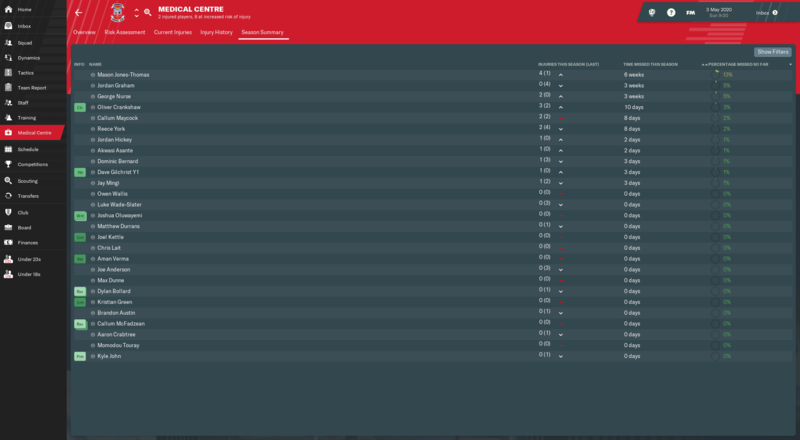 The 2020-21 season will see us compete in the National League, hopefully, we can avoid relegation or even be a mid-table team. 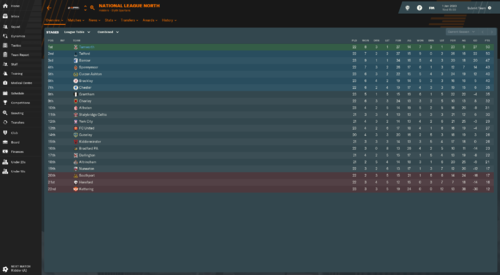 A mid-table finish is my target, though if we strike lucky in the transfer market and are able to build a strong team I would love to challenge at the top end and try to sneak in a promotion. Hopefully, we will also turn Professional next season. 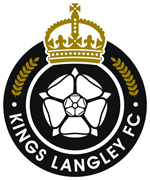 Manager favourite Reading FC had a yo-yo season which saw them flirting with play-offs before dropping down the table in last 6 matches to finish 10th. Hi there, sorry if it's been posted but I've finished page three and nothing there. I just get the same teams coming up every time I reload. I saved at 00:00 on Monday 24th June so the season summary isn't there. I tried going back (Thanks rolling saves) to the 18th June, went back and still the same teams coming up and down! I assume it's a bug, I just can't be arsed to wait around for the holiday time again but it looks like I'm gonna have to! 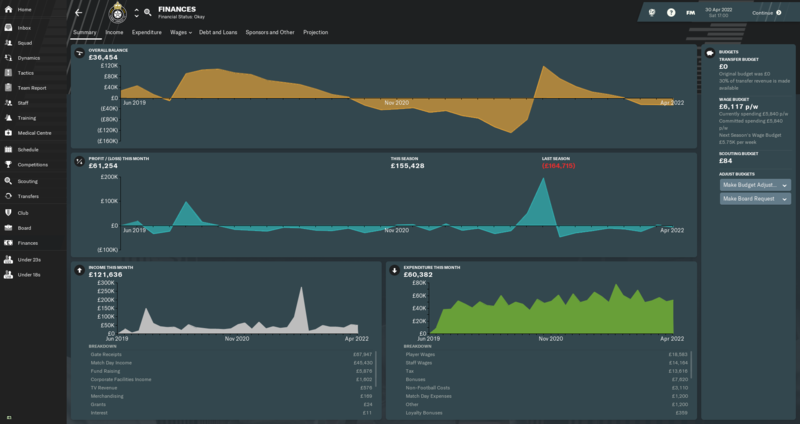 That does seem odd - are you using a custom database at all? @Prank Emperor - That's a great season, Mingi is a fantastic player at that level. Started the season well and thought that promotion was possible. However a series of draws (7 2-2's and 3 3-3's) often when dominating matches meant the team lost momentum. A decline in the defence and an inability to hit the target for the last 3 months of the season meant the team ended by staggering into the playoffs. Lost away to Dulwich Hamlet 5-3. In the FA the team reached the 4th Q Rd but were 4 down after 30 mins against VNL Leyton Orient at home. In spite of having more shots the team lost 2-4. in the FA trophy the team lost 0-1 to VNL Barrow at home in the 2nd Rd. Finances are strong as the team made a bit from preseason and then kept at that level thanks to an average attendance of 1100. Overall the squad is good but the right back is a problem and the CB's are inconsistent. Racine should be great at this level but under performs a lot. Rents was excellent mostly due to his set pieces but declined quite by the end of the season. The midfield was responsible for the good season as Janneh and Sangare ran things with support from the other center midfielders who all did well. Up front Kealy improved as the season went on but the team needs another striker who is more clinical. Great start to the season. By midseason we were in 8th place and looked as if we had enough points to stay up. Then it all turned sour. I'd rather not relive it so I'll keep it brief. 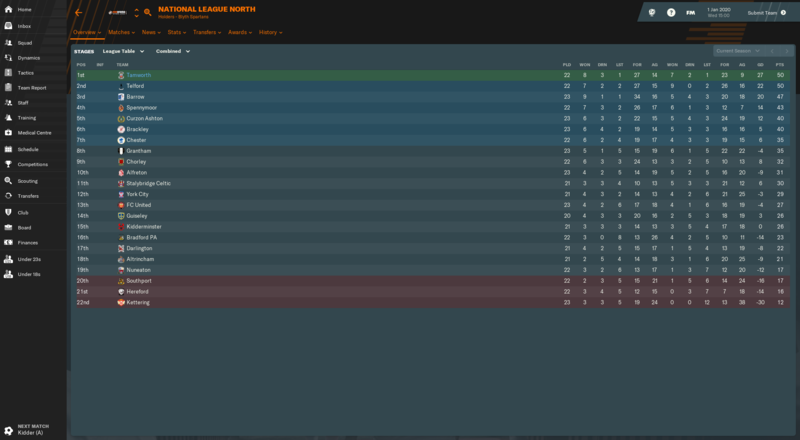 Finished 16th in the end, eleven points clear of relegation. Still no money for decent coaches or scouts. Wycombe Wanderers offered me a job interview. I was so tempted. I'll give this team one more season though. Yes and I got him tied down to a long contract, one of the few of my players who are on contracts that are not expiring at end of the season. I am. The same thing happened again after I holidayed again, so I'm gonna get rid of the custom database and hopefully get better results as it looks like I'm the only suffering from this. I really want to get Worthing like you because I live right next door to Worthing so that would be great. That's probably the issue, so I'll get rid of it. Thank you. 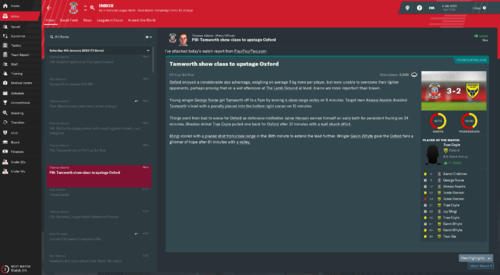 Statistically the season will go down as an improvement though that will offer skant consolation following defeat to Tamworth in the Playoff Final. Despite the lofty finish it was really a season of turmoil and one where i was getting close to getting the boot for losing the dressing room following a series of heated battles with key players over poor performances and underachievement as the club were 12th up to mid October. 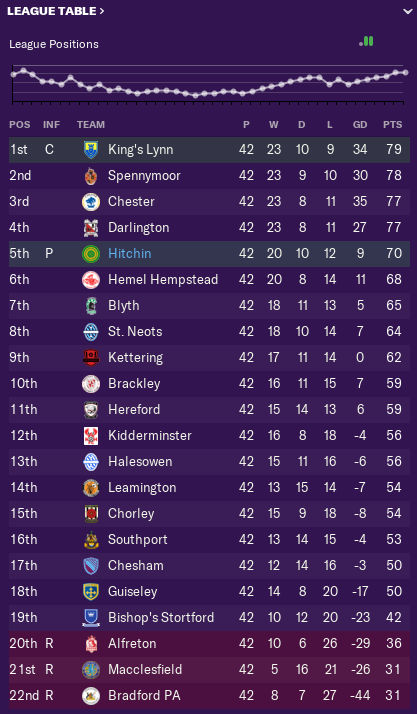 The fixture list where i played three of the bottom four in a row aided my turnaround though it was never going to be enough to catch champions Macclesfield Town as they lead throughout. 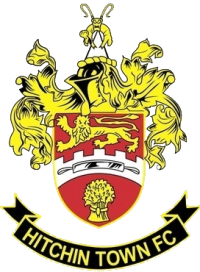 In the playoffs a 116th minute winner from substitute Emmanuel Adebiyi saw off Harrogate Town in front of a record crowd but losing the decider. 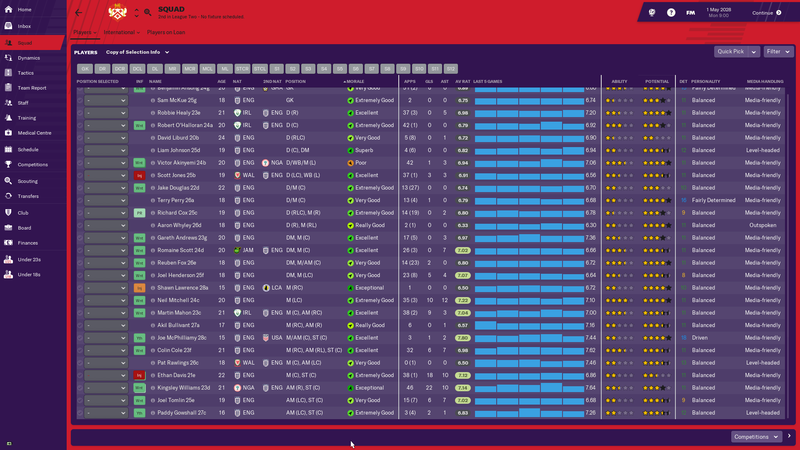 Had a good clear out, not sure if the players I have got in are good enough for mid-table as I wanted, every player that was like really really good and I wanted, they priced me out or did not even talk! These boys did not make it to the new season, Callum, in particular, was a pest as he was unhappy whole of last season and was on a long contract till next season. Had to pay him for mutual termination because he was bringing the happiness of the squad down. 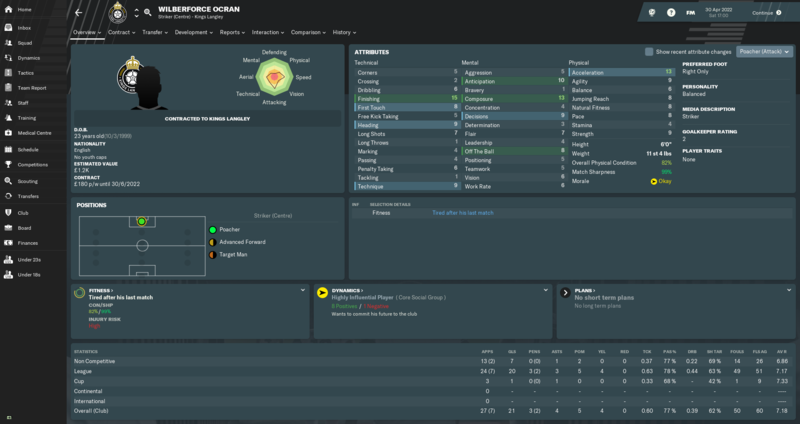 This guy was a dream player for me and he nearly accepted my contract after a 4-week trial only for Morecambe to come in a swoop him away! 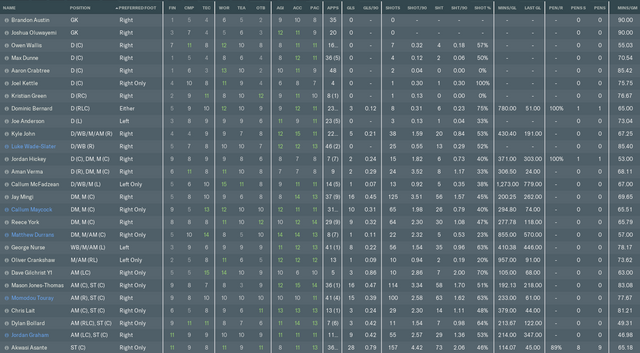 About to dive into my first league match of the season Leyton Orient who are predicted to win the league. I am not too hopeful of this season looks like I have a struggle this season, got wage budget to spare but no good player to spend on. @Prank Emperor - looking at that keeper, my keeper in VNS isn't much worse although with more flair, vision and passing. Makes me realise i should have him as a sweeper keeper. Last season was a bit of a disappointment as we slipped back to 8th and missed out on the playoffs. This season I was hoping we could get back up there and challenge for the title. League Table - we had some good spells, but just couldn't string together a sequence of wins to get us near the top. Eight 1-0 defeats this season cost us badly. FA Trophy - not a priority, but this was still disappointing. FA Cup - once again we came up short to the team in a higher division. Squad - the squad is pretty decent, but it's hard to find my best eleven players. Transfers - not too many this season. Finances - the rented stadium helped us out here as I was able to clear the debt. Wilberforce Ocran - top scorer, but I'm not sure he's really good enough. Tom Warner - the youth product is in the first team now. Ryan Clampin - a decent winger was badly needed. Joe White - our most valuable player is this new striker. 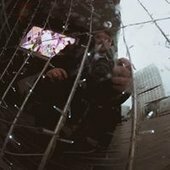 Josh Barnes - a decent DM is crucial to my team. I'd honestly be happy with just an improved league position, although we really need to make the playoffs. After 4 years fighting for safety, this season we changed the field to the smallest possible in width and length, got our two strikers with the best personalities working together, started playing through the middle by the assistant manager tip and we got promoted! Our home form was terrific and our away form appalling, but it was enough, and in the playoffs my preparation to have a determined squad seemed to give us the extra edge. Well, failed at Bamber Bridge, going down on the final day. Lucky to survive that long frankly, there were three other awful teams. Started out well, scoring a lot while conceding a lot. Unfortunately the scoring dried up while the defense didn't improve. On to the next challenge. 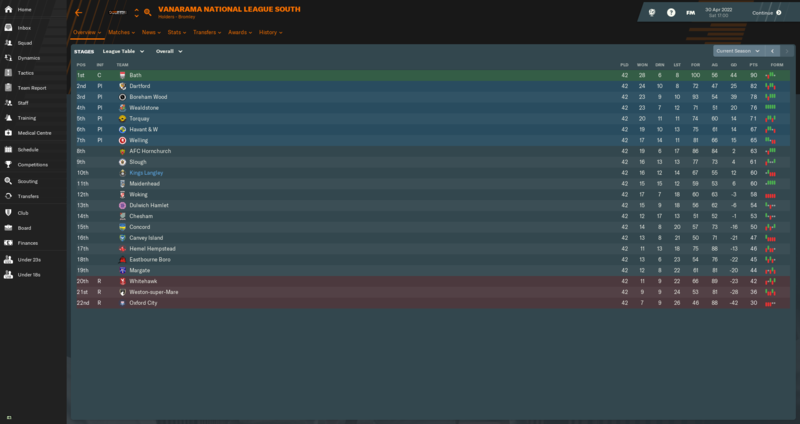 So finally out of the hell that is the National League last season and into the Football League. 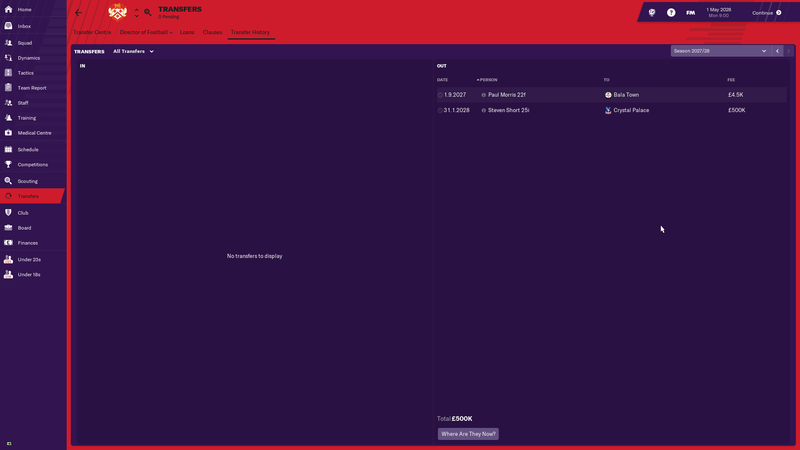 I were unsure what to expect, but my coaches rate a lot of my players as good enough for League One, and when the media predicted us around the top, I got hope we could compete. Early on, my hope were unfounded. We only won one of the first 6 matches in the league, but as it turns out most of those were against teams finishing in the top of the table come the end of the season. After the rough start we got in a couple of wins and got morale back up. We continued to play well and deserved something out of most of the matches we played, and indeed won quite a lot of them. Going into the half way mark we were comfortably in the playoff spots fighting for a possible promotion. After January had gone we were part of a 3 team race for the top of the table along Exeter and Mansfield. With only 6 games left we were guaranteed a playoff spot and very close to a promotion as well. At this point we started to play poor and only a strong win to Exeter gave us the ensured promotion. Exeter ran away though, but we managed to cling to out 2nd place in the end. 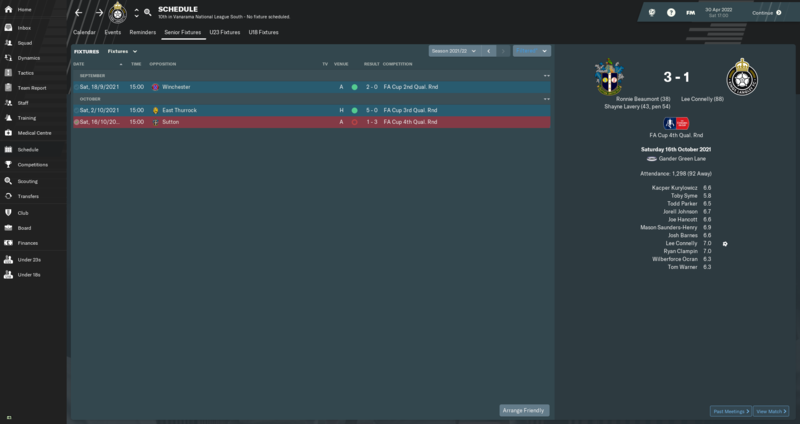 Up to League One we go! In the FA Cup we got to the 3rd round again, but drew Arsenal at home and lost. 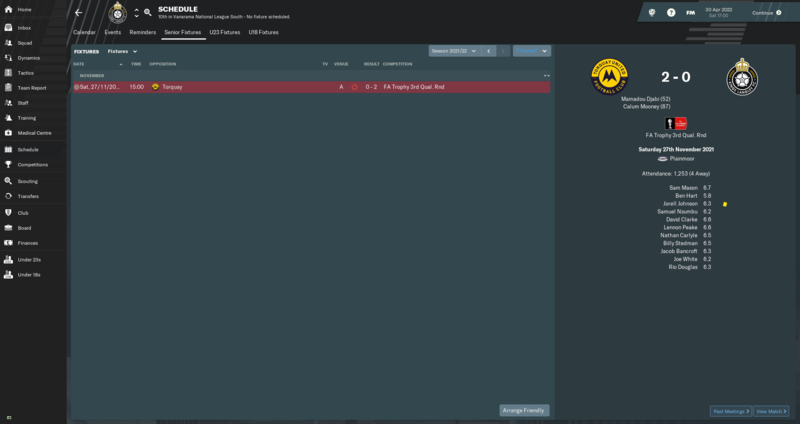 In the League Cup we lost to Burton in the 1st round. In the League Trophy we didn't get out of the group stage. 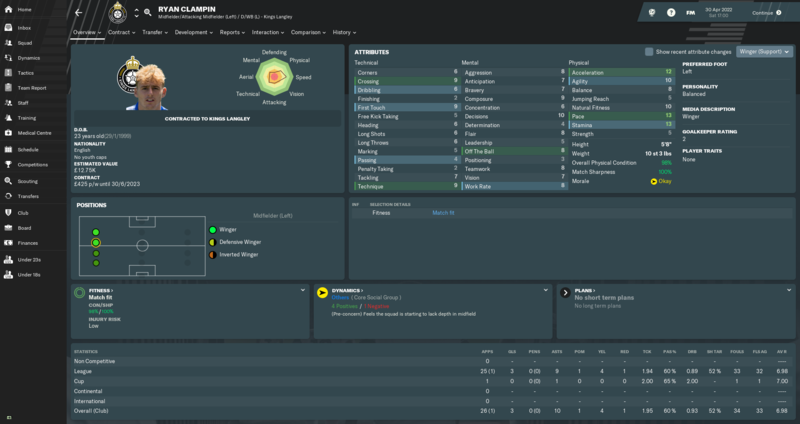 We had an ok youth intake with Joe McPhillamy 28c as the best one.